“Until one is committed, there is hesitancy, the chance to draw back– Concerning all acts of initiative (and creation), there is one elementary truth that ignorance of which kills countless ideas and splendid plans: that the moment one definitely commits oneself, then Providence moves too. From The Goethe Society of North America,and I’m still not sure if Goethe said it, but it’s outstanding. 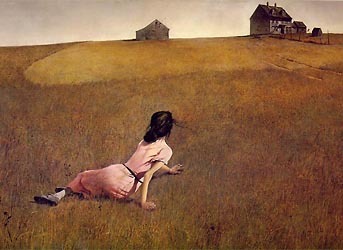 Image credit: Andrew Wyeth’s Christina’s World. Thank you, Helen. It moved me too, I don’t usually just post quotes but this was the right thing at the right time. It is true. anywhere in the world, it works. I agree with the first quote, but have a hard time with the second. John, I have not read that book yet. I am completely with you on your feelings about those two quotes!